Any large interior design project has different steps occurring simultaneously. Around the same time we were working out the structural and budgetary challenges of a renovation project (more on these in a future post), I began making notes on materials. Because of potentially long lead times involved I started my search very early. And because in our home much of our life centers on the kitchen, that’s where I began. Without sounding too “design-y” or conceptual, we wanted our renovated house to reflect the feel of our weekend and vacation lifestyle. We sought a place that was casual, soft-modern, warm in the winter but cool in the summer, neutral enough to be a calming backdrop on busy days, with a view that provided “colorful” accents from nature. I didn’t need to look too far for inspiration. One the pleasures I get from working in interior design is the constant discovery of interesting items, materials, and sources. Since the majority are not applicable to a project at that moment in time, I file the information away - either as a hard copy, an image, a blog post or just a memory. Many elements used in our North Fork home would be past discoveries, brought together in a new way. The absolute first item chosen for the home was the floors. Prior to renovation, much of the house had wall-to-wall, off-white carpet installed by the previous owners. While the carpet was good at absorbing loose sand tracked inside, I’m sure over-time it had absorbed lots of other materials and no amount of vacuuming could get it clean. It was time for a fresh slate. 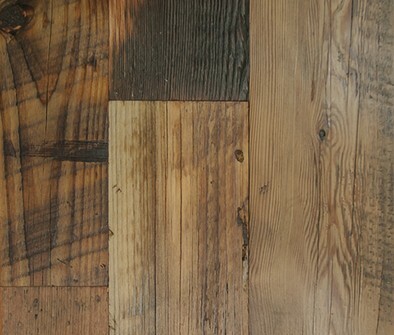 More recently, I met a supplier of reclaimed wood products, Pioneer Millworks, at one of the design shows in Manhattan. They stuck out in my memory not only because of their products, but because they had supplied the reclaimed flooring in the hardware and paint supply store around the corner from our Manhattan home. I filed away their information, just waiting for the right project. Years and years ago (maybe high school?) I had fallen in love with the look and feel of wide planked soft wood floors. There’s nothing like that feel of warm wood - naturally burnished and smooth underfoot and to the eye. If I could figure out a way to have these planks in our home, without falling prey to too much rusticity, life would be good. We finally settled on their “Grandma’s Attic” - a mix of softwoods that are warm, interesting, alive with variety. My initial thought was to temper the rusticity of the reclaimed softwood was stainless steel cabinets. We have a stainless steel kitchen counter in our Manhattan home and have been very happy with its clean look and feel within our messy lifestyle. After some fairly extensive research though, we found that this option would not be affordable at the quality we wanted and needed in our soon-to-be large and overly humid (in the summertime) kitchen. The combination of environmental factors, the size and layout of the kitchen, plus our budget limitations worked against my plan. Oh well – I’ll use it in a future project. We were still working on the house building plans, but knew that the kitchen would be larger with a good amount of counter space. I was working with a client on a kitchen design in Brooklyn. For that project, we were looking at a variety of white honed marbles. One day, while visiting the stone fabricator’s shop, we were shown a remnant of a polished stone called “Super White”. Its name is a bit of a misnomer – it has a white background but is full of grey movement – a very pretty stone that provides a view into the stone’s formation. After viewing the stone the first time, I kept seeing similar patterns in nature. Stone does not have a long lead time, but stock is limited to what is on hand at a particular stone yard and restocking is tied to quarry and transit processes. I usually help clients be flexible in their stone choices, as there’s nothing worse than having your heart set on a particular stone and then something goes wrong – the slab is damaged, the color or pattern varies from the sample, a shipment gets stuck in customs. But since I had many months prior to installation, I figured I could hold out for my first choice. I started searching the greater New York area for Super White. It wasn’t an easy search. Very few stone suppliers had it available, and to further complicate matters different stone suppliers will have different names for it. I found the same stone referred to as White American and Fantasy White. Also, anyone who has sourced stone may have noticed that I have yet to say what type of stone this was. The first fabricator and stone yard I worked with in Brooklyn classifies it as a granite. One of the large eastern suppliers lists it as a marble. Most refer to it as a quartzite. I got a little obsessed with this question and wondered if I needed to take a geology class. The best answer I received via one stone yard manager was that it is a quartzite, but that it has a small quantity of calcite present in the stone, causing it to share some qualities with marble. Anyhow – sounded good to me. All this means is that it is a very hard stone (good for kitchen counters) but is prone to a small amount of etching and wearing over time, which was fine with us. After a few months of tracking stone shipments, I learned that Stone World Imports in Farmingdale had a new lot of Super White available. I quickly drove out, walked their yard and found two beautiful slabs. Finally. It was months before the stone would be needed, but the purchase was complete. With these two dominate materials – floors and countertop – the vision for our kitchen was starting to come together. We would accent it with a few bright colors – a small sink side rug, some pottery, a game/bookshelf, but the main accent would be the beautiful view outside, now a part of our kitchen. Work-in-progress. Better back yard views from our new kitchen and a glimpse of the wide-planked, softwood floors.